Roasted red peppers. Who can resist them? When can you ever make enough of them? And does anyone really not mind peeling them? That is one job that I just HATE. I’ll clean a kilo of sardines before I’ll tackle a kilo of peppers. A recent batch of red peppers was pureed and then turned into red pepper ‘glass’ and red pepper ‘leather’. The glass is brittle and shatters and then instantly melts in your mouth, the leather is like fruit leather, soft, malleable and sometimes sticks to your back teeth. 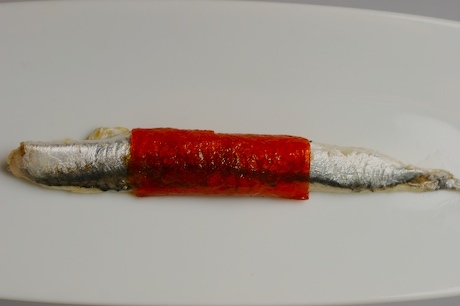 The other night we wrapped some red pepper leather around a marinated white anchovy. It was good, but next time, I think the addition of a little crème fraiche would make this much better. Roast the peppers in a hot oven (375-400F) until the outsides are charred. I lay mine on newspaper with a layer of salt underneath that both serves to soak up excess juice and helps keep the peppers from being soggy. When they are done, remove and either place in a paper bag or cover with more newspaper until they are cool enough to handle. Peel the buggers, removing all the seeds and then puree the hell out of it. Now add the other ingredients and puree some more. You want a really smooth consistency, so a pass through a fine meshed strainer is a good idea. 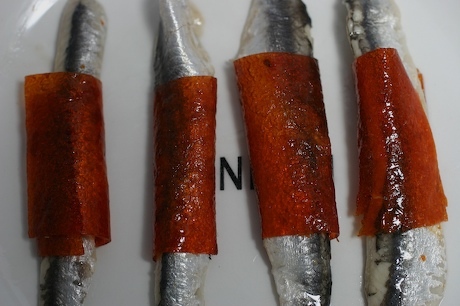 Spread thinly and evenly on a silpat and roast in 225 F degree oven for about 1 hour. Glass should be spread very thin, leather a bit thicker. To check for done-ness, tickle the edge of the pepper mixture, and when you feel it is coherent enough to pull off the silpat, it’s done. Remove from the silpat and gently place on the counter to cool. Shatter the glass and scatter on whatever needs a little red lift. Wrap the leather around anything…an olive, a piece of cheese, your finger.